The Binary Robot WS (Winning Systems) software and trading robot is a SCAM, and we blacklisted it in our fair and impartial Binary Robot WS scam review and investigation. Our complaints desk just received a fresh flurry of grievances in regards to a new fake binary options robot which has just been launched (and with good reason). It seems there is a new affiliate network who is promoting this fake auto-trader, and these crooks are very aggressive marketers. If you have received any form of SPAM email communications, illegally soliciting you to join this thieving app, you should know that you are being targeted by professional con artists. 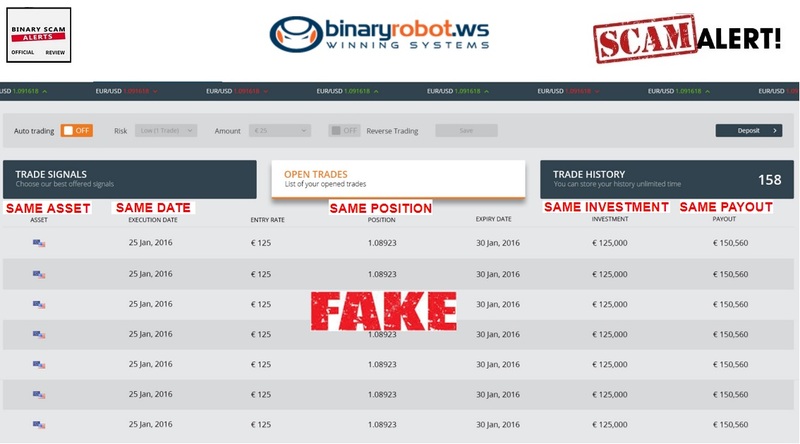 It’s understandable why you would think the Binary Robot WS is a legit or genuine trading app. After all, it comes across as a very impressive system and one which seems to be worthy at first glance. However, these cheaters got caught with their hand in the cookie jar, and stealing money is a shameless and despicable act which deserves our utmost attention. Keep reading to see how we exposed this filthy band of crooks, and why we believe this bogus app is a confirmed investment scam. Below you will see a screenshot of the binary robot WS main sales page. If you click on the history section a list of trades will open up for you. All of these trades are either photo-shopped or pre-programmed on rigged software which can be manipulated to produce winning or losing trades at the behest of the developers behind it. If you take a closer look you will see that all the assets are the same, as well as for the execution date, entry date, position, expiry, investment amount, and payout. This is an obvious con job and there’s no way this can happen in real life. Binary Robot Winning Systems No Downloads, no Stress and no fees. Join BinaryRobot.ws today! That is the first message which is presented to us in the minimalistic sales page. The promoters boast an easy-to-use and intuitive trading app which runs on auto-pilot and generates passive income in a secure and stress-free trading environment. This is a very professional looking app, and they explain exactly how the settings work and how to start using the auto-trade function. The trading history section is totally forged as we have previously shown, and the profile section is just personal details. Here have a technology which is being sold as a “winning system” which factors in modern trading techniques. A personalized trading experience and a super VIP club are both touted as something which is unique, but in fact its merely a facade with a polished exterior. In reality what we are looking at here is a very sophisticated investment scam which is designed to look professional, but quite the opposite is true. Its correct that we don’t see all the hyped up claims of exaggerated earnings, inflated bank accounts, and fake testimonials. But fudging the numbers in such a crude and illicit manner is both unethical as well as foolish. Better move forward and hold on to your wallet. No, it is not and even they say it in their FAQ section. Its going to cost you a minimum of $250 to get started, and that money will be charged to your credit card by rogue offshore brokers operating from shady jurisdictions like Vanuatu. Our Binary Robot WS review is genuine, however there are many who are not concerned about ethical business practices and simply accept bribes in the form of commissions when publishing favorable Binary Robot WS reviews. The hot scams which are trending now are Binary Robot 365 and Bitcoin Trader. If you are deliberating and not quite sure about how to proceed and which system is best for you then you are not alone. Fortunately our team of diligent researchers has combed the interned and compiled a short yet reputable list of consistent money-making machines. These are all proudly showcased in our recommended section. The Binary Robot WS (Winning Systems) software is a bona fide scam and rightfully blacklisted in our honest and insightful review. Make no mistake, if you decide to test the waters and deposit using your credit card you will in effect be compromising your financial state of affairs. We already had a few complaints about thieving brokers who are using scam tactics such as delaying withdrawals and overcharging on credit cards. We can pretty much guarantee that the Binary Robot WS was designed with pure malice and the deliberate intent to defraud innocent would-be traders and opportunity seekers. The fraudsters behind Binary Robot WS are widely known in the business and have a bad reputation as well as a documented track record for internet crimes related to credit card fraud, identity theft, tax evasion, and false advertising. In light of the conclusive and indisputable evidence which has been presented here, we are compelled yet again to blacklist the Binary Robot WS (Winning Systems) app and advise our members and viewers seek alternative investment avenues. As always, we invite you to join our Facebook Group and YouTube Channel, so start getting educated today.